Since its inception in 2004, 2,180 individuals have graduated from PEP. Between 2004 and January 2018, PEP graduates have established 361 businesses. Fifty-seven percent of the businesses remain open today, which is higher than the average for Texas during the same time period (53 percent). In total, nearly one in four released PEP graduates have started a business. Impact Analysis of the Prison Entrepreneurship Program: Reducing Recidivism and Creating Economic Opportunity. Of the PEP graduates who do not start businesses, most are gainfully employed. In 2017, 67 percent of PEP graduates surveyed were employed, while 28 percent were entrepreneurs actively running a business and just 5 percent were unemployed. Both PEP graduate employees and entrepreneurs earn significantly higher wages than the Texas minimum wage. The average wage of PEP graduate employees surveyed was $17.17 per hour, 137 percent greater than minimum wage. The average wage of PEP graduate entrepreneurs surveyed was $21.19 per hour, 192 percent greater than minimum wage. 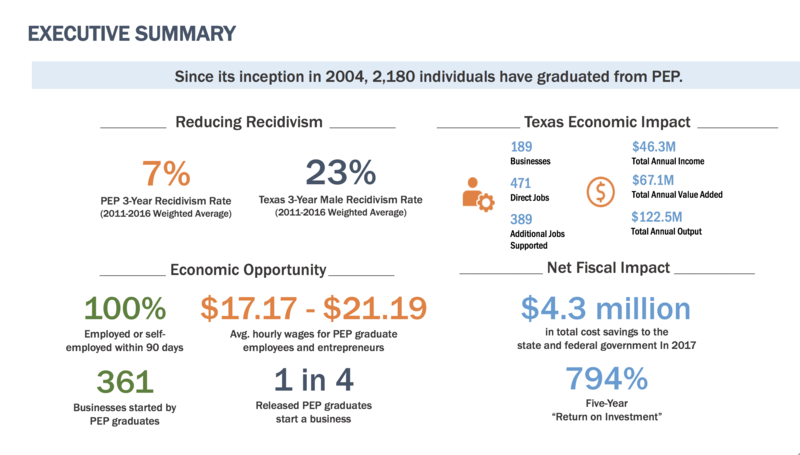 The average income of PEP graduate entrepreneurs was 276 percent greater than the average hourly earnings for formerly incarcerated men in Texas. Incarceration and recidivism are significant challenges in Texas, especially for men. Over 125,000 men were incarcerated in Texas in 2016 and 23 percent of males released from a state prison in Texas will return to prison within three years of release. In comparison, only seven percent of PEP graduates return to prison within three years of release. PEP’s curriculum and leadership training is designed to help students develop re-entry plans and build hope, optimism and resilience. For many graduate entrepreneurs ICIC interviewed, they felt that the lifestyle changes they made while in prison were the biggest factors in reducing their chances of going back to prison. The economic impact of all active PEP businesses in Texas was measured using IMPLAN in partnership with the University of Massachusetts Donahue Institute. Note: Additional jobs supported are indirect and induced jobs. Total annual income, annual revenue, and annual output include direct, indirect and induced impacts. Source: IMPLAN, University of Massachusetts Donahue Institute analysis. In 2017, 357 PEP graduates were released from prison. The estimated fiscal impact per released graduate after one year was $12,053 in cost savings to the state and federal government. PEP’s annual program costs $2.7 million, which is fully funded by private sources, including corporate, philanthropic and individual donations. The one-year investment of $7,591 per released graduate by PEP donors results in a one-year “Return on Investment” of 159 percent. After five years, the “ROI” increases to 794 percent. PEP has demonstrated that entrepreneurship works as a deterrent for recidivism and should be considered as an alternative to traditional ex-offender workforce development and re-entry programs. Businesses created by PEP graduate entrepreneurs have a significant impact on their community and many operate in areas with limited economic opportunities and create jobs for formerly incarcerated individuals. It is a program worth replicating in other states dealing with high incarceration and recidivism rates.